Happy Labor Day! It's still not to late to enjoy a last little bit of Summer! One of the best things I made this summer was a hammock! I've always wanted one but never could justify the cost! I was so excited when I found a hammock tutorial on the website of Modern Textiles, the quilt shop in Fargo, North Dakota, which I mentioned in a previous post. The hammock is made using home dec weight fabrics. The outer red fabric I used is canvas weight, decorated with Setters! I bought it to make slipcovers--it wasn't flexible enough for that, but is perfect for the hammock. The inner fabric is leftover from curtains I made. This hammock would also be a great way to up-cycle draperies that you no longer use but that are still in good condition. The hammock only requires straight seams and can be stitched up in an hour or two. Very easy! I've hung it on two posts on my deck. That's probably not a sturdy enough anchor if you expect kids to use it, but it works for me. The tutorial has links with suggestions on how to hang a hammock which is great! 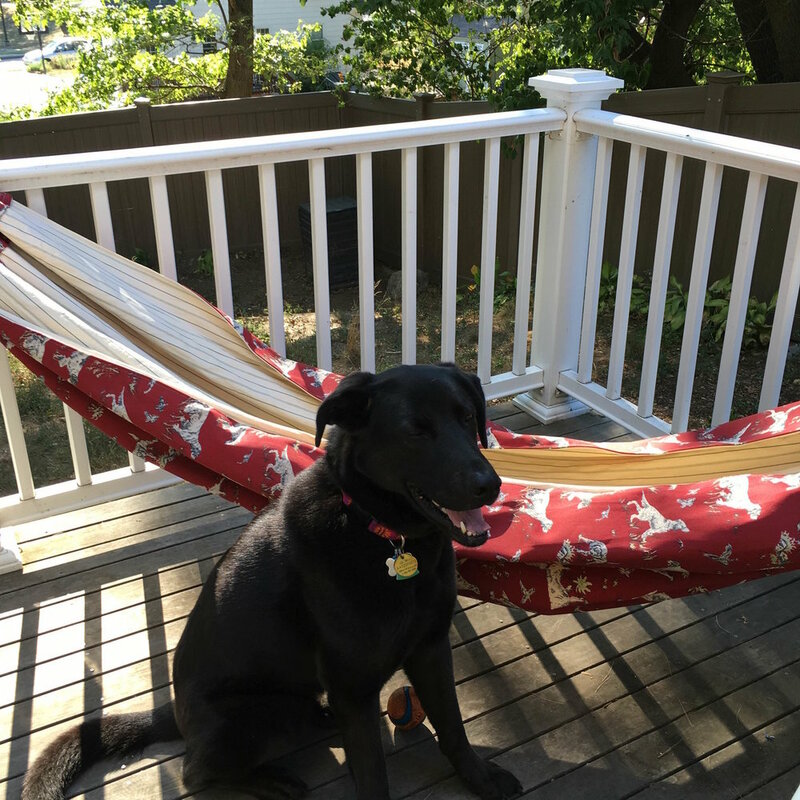 Here's Hazel next to my hammock. She's never tried to use it, but Tipper has! (An activity which I've discouraged)! It's really comfy, especially if I take a throw pillow out when I play to read a book! You should make one!